Good morning, everyone! If you’ve been following me through the summer, you all know what a problem I’ve had with my garden – heat, drought, problems with soil, more heat, deluge of rain. So, it’s not surprising that I haven’t had large enough harvests to can anything. Until this week. Forgive my excitement, but this is THE first thing I’ve canned all year! 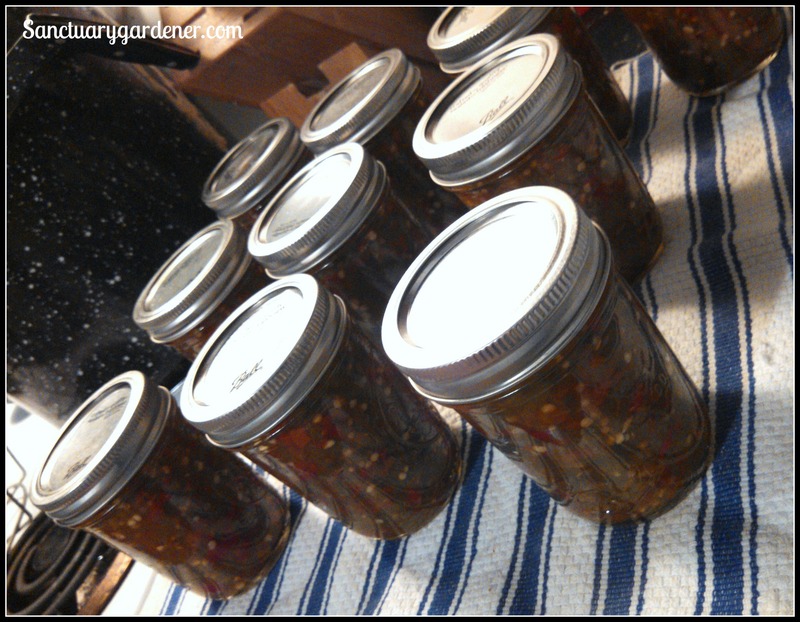 This past weekend, I harvested enough hot peppers and almost enough sweet peppers (had to buy two bell peppers at the store) to make a batch of hot pepper relish. My absolute favorite. Normally, this wouldn’t warrant its own post, but I was so excited to can SOMETHING this year, I had to share it. Unfortunately, this may be the only canning session of the year (unless I get some produce from the store to make holiday gifts). The fair begins tonight (for eleven days), but I didn’t have anything to enter this year. Even this batch was too late to enter. Trying to cheer me up, my son said, “Well, Mom….you’re just giving other people a chance to win this year.” What a hoot he is! You can bet I’ll still be checking out the competition this year, and I’ll be sharing that with you in the next week or two. What did you can this year? Share with me, so I can enjoy yours from afar.